The words for “abundance and fish” are pronounced the same in Chinese “YU,” and because of this – fish are considered to be the symbol of WEALTH in Chinese culture. Thus, it is customary to the Chinese to serve a whole fish last at a banquet. Every Koi fish has its own beautiful – unique color. Color symbolizes different things like: friendship, success, luxury, wealth, luck and good fortune. The different colors also symbolize different members of a family as well. All KOI are beautiful and exude ENERGY, representing POSITIVE meaning. Whether you prefer gold fish, tropical fish or Koi, one fish should always be BLACK. It is believed that the black fish absorbs negativity and SHA CHI (bad energy) in the environment, allowing the other fish to collect prosperity, energy, and good fortune that they pass on to their guardians. If a pond or aquarium is not doable in your outer or inner environment, then a painting of Koi “metaphorically” sets the intention for prosperity and good fortune in your home. Fish also symbolize marital happiness, harmony, and reproduction – since fish multiply rapidly and sometimes swim in pairs. In the Buddhist religion, fish are among the auspicious signs on the footprints of Buddha. Footprints of fish on Buddha signify freedom from all restraints. 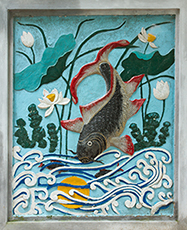 In order to express the wish of having more happiness, fish are painted with lotus and magpie in Chinese culture. The magpie symbolizes happiness. The Chinese character (letter) for lotus means “in succession or one after another” and the character for fish represents “more”. Koi and goldfish are usually depicted in Chinese paintings. Give a man a fish and you feed him for a day. Teach a man to fish and you feed him for a life.